The report looks great at the headline and most of the detail backs it up. There are a couple of rough spots in the usual places so let’s take a look. The headline posted 223k net jobs added and the private sector accounted for 218k of those which keeps the 2018 average above 200 and revisions to March and April netted us 15k. The Total Employed rose and the Total Unemployed fell while the Labor Force got a little bigger. 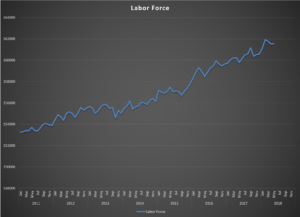 The Participation Rate and Not in Labor Force stats remain stubborn with the former falling a tick and the latter rising for a third straight month and flirting with 96M. The baby boomers retiring is certainly a factor but that bleeding has got to be slowed. Trade and Transport, Retail, Services, Manufacturing and Construction were all big gainers and wages showed some signs of life with Y/Y up 2.7% for hourly employees and a full 3% for salaried workers. The work week was 34.5 hours long for May which is exactly the average for 2018 to date vs. 34.4 hours for 2016 and 2017. A stat that is not highlighted too much outside of Blue World’s report is actually the big indicator today. The Diffusion Indexes have remained above 60 for three months in a row. That hasn’t happened in a while and is a great indicator of underlying strength in the labor markets. Because they are both due today, we’ll combine jobs analysis with a summary of May’s Blue World Economic Index® which actually hit .2 intra-month for the first time since we’ve been publishing it, but just couldn’t hold that level as the Real Estate major category took a beating in the final week. Regardless, the index did advanced to .18, matching the recovery record high set in January of this year. Matt will be on AM780 and 105.9FM in Chicago at 12:09 today to break down the jobs report live and the Podcast can be found later this evening.